Error: Error validating access token: Session has expired on Saturday, 30-Mar-19 21:52:53 PDT. The current time is Thursday, 25-Apr-19 20:49:23 PDT. The annual “Coogee Jetty to Jetty Swim” is organised by Cockburn Masters Swimming Club through a Sub-Committee which diligently plans and delivers the event on behalf of the club. 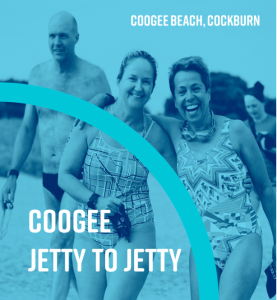 This year’s event is Coogee Jetty to Jetty Swim XXIII and will take place on Sunday 10th March 2019 at Coogee Beach, WA. Perhaps most famous for being one of those rare and special community events which caters for all, it includes a beach walk, multiple swim distances, a post-swim community breakfast and a festival family atmosphere for all to enjoy, with swimmers aged from 8 years upwards and into their 90’s. Offering three swim distances (250m Try-It, 750m Splash and 1,500m Classic) in pristine waters at Coogee Beach, the swim’s popularity and entry numbers continue to grow from year to year and the event has “sold out” in each of the last two years. Our club’s vision is “to provide the most enjoyable family-oriented open water swim in WA” so come along and see if we have succeeded! Of course, a big thank you to our major sponsors for allowing us to make this event happen. All swimmers (pre-registered online) must report to the registration desks in the designated Check-In Area on the morning of the event between 6.45am and 7.45am to collect their race pack (timing band, race tattoo & swim cap). Please car-pool, walk or cycle to the venue if you have the opportunity. Parking is at a premium, so arrive early and plan ahead. Check-In desks will be closed promptly a 7.45am for safety purposes so please allow yourselves MORE than enough time to make your way from parking areas to the Check-In area or you may not be able to swim. The swim takes place in the ocean between Coogee Beach Jetty and Woodman Point Jetty and runs parallel to the beach in generally shallow water. All swimmers MUST attend the Compulsory Race Briefing which takes place around the Woodman Point Jetty at 8.00am. After the relevant briefing, swimmers walk from the Woodman Point Jetty along the beach to their start line – either at the Coogee Beach Jetty (1500m Classic), the designated marker buoy half way along the beach (750m Splash) or the 250m start line & marker buoy. This year, the 750m Splash start line and 1500m Classic start line will be marked by new inflatable duck marker buoys called Danny & Daisy, one of them positioned in the water at each start line. Wave starts of approximately 100-150 swimmers will be used at each start line (based on entry times nominated). The starting procedure is simple and will be explained fully at briefing. The 250m Ty-It swim will be started in smaller groups. Water safety is kindly provided by Coogee Beach Surf Life Saving Club and other land support/first aid is provided by St John Ambulance. A simplified set of Race Rules has been developed in conjunction with Masters Swimming WA (MSWA), which provides insurance and sanctioning of the event. View the WOW Swims Local Rules here. Swimwear rules are easy – basically, anything goes – with the exception of wetsuits (which ARE allowed with swimmers wearing wetsuits placed into a separate WETSUIT category for prizes). All swimmers swim in the same direction towards Woodman Point Jetty and finish the race by swimming under an in-water finishing boom where a time is recorded. Unless we lose her again (! ), you will all swim past Daphne the Duck as you approach the finish boom so wave and say hello! Swimmers then make their way to the shoreline, through the finishing arch and into the recovery zone where fruit , water and other hydration drinks are available. A full breakfast is served immediately after the swim for those who have purchased breakfast vouchers. A special Kids Brekky Bag is also available for the young ones (containing a cereal box, juice box and a piece of fruit). Throughout the course of the event, there will be activities available for the younger kids – including music, face painting and other activities hosted by Junior Goals which will include an inflatable soccer goal on the reserve. Our event wants to keep encouraging the younger kids to be healthy and active. These activities will take place at the Woodman Point Reserve and also on the beach during the swim. Kids aged 8-11 are also encouraged to have a go at ocean swimming as part of the 250m Try-It Swim. After the swim, there will also be some games and a photo competition involving Daphne the Duck on the reserve so we can all have a bit of fun while organisers prepare for the presentations. After a short break in proceedings, prizes will be awarded and various other presentations made by officials in the Presentations Area of the Woodman Point Reserve. We thank DBCA for allowing us to use the Woodman Point Reserve for the event and remind all participants that there are NO PETS ALLOWED either on the reserve or the beach. Coogee Jetty to Jetty Swim XXIII is part of WOW Swims – the community swim series for all. WOW Swims are designed for swimmers of all ages and abilities to experience the thrill of open water swimming in a range of settings and over a variety of distances, and to encourage participation in community events as part of a healthy lifestyle. Check out all the WOW Swims events here. All swimmers who take part in Coogee Jetty to Jetty Swim XXIII will earn points in WOW Swims series for the 1500m Classic and 750m Splash events. The 250m Try-It swim is not eligible for points. 1st Male & Female Wetsuit – $150 Cash, Souvenir JTJXXIII Prize Pack & Medal. 1st Male & Female in Each Age Group* – Souvenir JTJXXIII Prize Pack & Medal. *Age groups for race day prizes are 11-14, 15 – 24, 25 – 34, 35 – 44, 45 – 54, 55 – 64, 65 – 74, 75 and over , with all age groups determined using a swimmer’s age on the day of the race and gaining no other trophy (GNOT) rules also apply. A selection of Spot Prizes are also awarded with the support of our event partners and sponsors and are allocated at random during the online registration process. Where possible, Spot Prizes will be distributed on the day of the event at the Check-In Area. A small number of other major Spot Prizes may be announced during the Presentations after the swim. All prizes are subject to change at the discretion of event organisers. Full race results, finishing times and downloadable certificates (from 2011 onwards) are available by using the links below. Always popular amongst swimmers, walkers and other spectators, breakfast can be purchased online with your swim entry and merchandise. A special Kids Brekky Pack (cereal box, juice box & piece of fruit) is also offered for the young ones. Freshly brewed cappuccino/coffees, cold drinks and snacks are also available to purchase separately from the Woodman Point Kiosk which will be open on event day at the John Graham Reserve. The event takes place at John Graham Reserve, Nyerbup Circuit, Woodman Point, Coogee WA. A large number of visitors come to the area around Woodman Point on the day of the event quickly filling the main car park. With permission from DBCA, additional overflow car parking is available at O’Kane Court to the south of John Graham Reserve – enter off Cockburn Road. You may enjoy a 1km walk to the main event area or catch one of our courtesy shuttle buses to and from the main event area. Please allow extra time to make sure you attend the Check-In Area which closes at 7.45am sharp. The swim takes place in the ocean between the Woodman Point Jetty and the Coogee Beach Jetty. Online Entries opened on Thursday 1st November 2018 at 7.00am. Registrations are only accepted through our secure online registration process OnReg operated by blueChip Timing. Entries are capped – with a total limit of 1,200 swimmers in place for 2019. The event has “sold out” in each of the last two years so you are encouraged to enter online early. Late entries are NOT accepted in person on the day of the event if the event is “sold out”. *Discounted Early Bird entries are available until 10:00 pm on Thursday 31st January 2019, and all online standard entries close at 10:00 pm on Friday 8th March 2019. Further discounts for families have proven a popular way to get the whole family involved and are again offered in 2019. There is an option for a Family Entry during the Early Bird entry period only for 2, 3, 4 or more family members to gain further discounts to individual entry fees, look out for the special “Family Entry” options when you enter online. **With the help of our event sponsors, the cost of discounted family entries has been REDUCED since last year. The family discounts are also only available until 10.00pm on Thursday 31st January 2019. 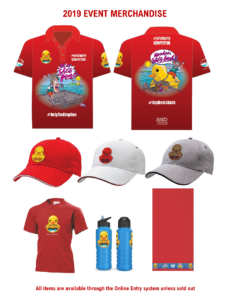 Souvenir Merchandise for Coogee Jetty to Jetty Swim XXIII is available to buy online – this year there will be shirts, towels, a brushed peak cap and a drink bottle – all featuring our beloved Daphne! Limited quantities are available so order early to avoid disappointment! We wish to express our sincere thanks to local cartoonist Brett McPherson who produced the two images which have been incorporated into the 2019 merchandise. On ya Brett, we love them! The event could not take place each year without the generous support of our partners and sponsors. The year’s event is again generously assisted with funding from the City of Cockburn as the major supporting partner through a significant partnership which has been developed over the last several years. Their assistance is invaluable and reflects on their fantastic ongoing commitment to the local community. As part of this partnership, we are pleased to be able to host a fantastic post-swim breakfast in the catering area which will again be known as the “City of Cockburn Community Big Breakfast”. Our sincere thanks to Presenting Sponsors for assisting us again with the event. We welcome the significant contributions to the event received from each of the following Presenting Sponsors – Fremantle Ports, Port Coogee, ASB Marketing and HopgoodGanim Lawyers. Essential event support is also received from Gold Sponsors Aussie Natural Spring Water, Regis Aged Care & Sportzcorp. Blooms The Chemist Port Coogee, Bindi Nutrition, The Chia Company, The Happy Snack Co, Dept. of Biodiversity, Conservation & Attractions, Cockburn Cement, Dome Port Coogee and Instant Toilets & Showers are all Silver Support Sponsors for this year’s event. This support from ALL of our generous sponsors contributes to the success of the event for all involved. We encourage you to support them whenever an opportunity arises. Building on solid historical foundations, the current Council’s vision is to ensure that the Cockburn of the future will be the most attractive place to live, work, visit and invest in, within the Perth Metro area. Port Coogee offers you the best in coastal living with beautiful beaches, a world-class marina and a vibrant environment. Just 5km from Fremantle, Port Coogee offers a true neighbourhood way of life where residents can enjoy living in a safe environment with a strong community spirit. A variety of living options are available from low maintenance cottage lots, family-sized lots, premium waterfront lots, and exclusive island lots through to future apartments and penthouses. The WA Government’s trading enterprise which strategically manages the Port of Fremantle, Fremantle Port Authority is the largest general cargo port in the State and the fourth largest in Australia. ASB Marketing is a Perth based promotional merchandise & marketing company established in 1992. We supply small, medium and large organisations with a wide range of quality branded promotional merchandise. We pride ourselves on being creative and using our extensive resources to provide you with successful solutions for your organisation. ASB has the largest and most comprehensive showroom in WA and welcome appointments to view our range of promotional merchandise first hand and to discuss your requirements in more detail. If you’re looking for promotional products, merchandise or corporate gifts – contact us today. HopgoodGanim Lawyers is a full service commercial law firm. We operate nationally and internationally with a focus on Asia from our two key locations of Brisbane and Perth. We offer highly skilled and agile legal teams across key sectors and areas of practice. In all of our areas of speciality, our lawyers are recognised by legal publications as leaders in their fields. We are tenacious, trusted, no-nonsense professionals with a track record of delivering tailor-made solutions that exceed clients’ expectations. Our logical, rigorous way of working means we can manage large, complex projects as well as smaller concerns – all within tight timeframes. At Regis, we offer a number of aged care service options for short stays, respite care as well as different levels of personal service and comfort with Club Service, Reserve and Classic to chose from at select facilities. Aussie Natural Spring Water is a proudly Western Australian owned and operated spring water company. The Darling Ranges: home to some of West Australia’s most pristine national parks and rock formations. Here, some of the oldest rocks on earth lies exposed; the granite, quartzites, and gneisses are from an ancient time of over 2,500 million years ago. It’s at this amazing location that Aussie Natural Spring Water sources the fresh spring water that our customers love. These natural springs act as filters, with water moving gently through layers of rock and sand and into protected aquifers- this can mean travelling thousands of kilometres through nature’s filtration system for up to a hundred years. This water is carefully drawn from our natural springs, and transported to Perth in stainless steel tankers. Before the water has reached our bottling facility, it is already among the most purest water to be found across Australia, then to be passed through further spring water micro-filtration systems in our state-of-the-art Perth facilities. This also includes the assurance that we have eliminated any harmful microorganisms or bacteria from the water, with an ultraviolet sterilizing unit. This technologically advanced electrolytic process is only the finishing touches on Mother Nature’s long and laborious natural filtration system, so we can guarantee a safe and great tasting product. Sportzcorp provides a diverse range of support services to sporting events, associations, clubs and their members including event management, event services and consulting services. Also part of the Sportzcorp team is Yellow Event Services (YES), a specialist event services business which has developed a reputation for expert and reliable execution of all aspects of planning, design, delivery and management services required by owners and organisers of mass participation sporting events in WA. YES aims to deliver high quality, consistent, safe and professional events for all stakeholders involved. Our Blooms The Chemist team is proud to be a truly community-minded network of Pharmacies, providing the highest level of professional health service and advice to you and your family. At Cockburn Cement we are committed to safe, sustainable production. Helping to build strong communities in the areas where we operate underpins our community engagement program. We aim to support communities within our local area through an involvement in community programs, including supporting local schools, sporting clubs and other organisations. We provide sponsorships and donations to local community and not for profit organisations to support their important work. Through partnerships, we can help bring together community organisations to develop programs of significance and facilitate joint opportunities that will have long term benefits for the local area. Directly and indirectly we support more than 2000 jobs, many of them in the region around our Munster Plant. Come along to one of the most spectacular locations in Perth, situated overlooking the stunning new marina at Port Coogee. Enjoy traditional coffee or something to eat from the classic menu, there is something for everyone. You can also “BYO”. The Happy Snack Co’s number one priority is to make you feel good about the snacks you eat. Their range of roasted Chic Peas and Fav-va Beans are 100% nut and gluten free and come with a 5 star health rating, so you know you’re making the right choice for you and your family. A leading manufacturer and supplier of a complete range of portable sanitation products through their 5 star range of portable toilets and showers. Formerly part of DEC, this new department focuses on nature conservation and the community’s enjoyment and appreciation of Western Australia’s world class network of national and marine parks. A true Aussie success story… it began in 2013 as Belinda Dennis fulfilled a need for something better in the sports nutrition market. In Belinda’s case, it was the availability of good quality, natural, healthy, Australian-made sports nutrition products that could support her passion for triathlon. The only sports nutrition products she could find on the market that suited her requirements needed to be imported from the US. The idea to start a business here in WA was formed. Belinda used her background in science to develop formulas for a Natural Sports Hydration drink containing a specific range of electrolytes, with low sugar (30% less than many other products on the market), with plant-based flavouring and no artificial colours, sweeteners or preservatives. She was interested in creating products appropriate to sports in the Australian climate, and that are absorbed quickly and, in turn, gentle on an athlete’s gut during intense endurance events. Eat chia and run! Many athletes eat chia to improve their endurance, aid mobility and help with muscle repair. Chia seeds swell up when soaked in water and form a gel-like substance. This slows the conversion of carbohydrates into sugar, keeping your body fuelled for longer periods of time. Australian grown wholegrain oats and sun ripened chia are blended with pure dried coconut milk and dried coconut flakes to give our ‘just add hot water’ Oats+Chia delicious creaminess that is dairy free.